There’s no shortage of demand for photo filter apps, Nevercenter’s CameraBag 2 among them. The app is a revamped version of the company’s CameraBag for Mac. It sports a bevy of new features, including more than 100 adjustable filters and dozens of editing controls. CameraBag 2 offers more editing and filter control than the original Mac app or its iOS counterpart. Users can view all available filters for a photo using a tile-based system. Once you select a filter, you can make basic and more advanced edits: CameraBag 2 offers exposure, vignette, saturation, color correction, and curves controls. Most importantly, if you’ve designed a look that you’re especially fond of, you can save it as a custom filter for later use. Similar to more-advanced photo-editing software like Photoshop, CameraBag 2 features an active history timeline, allowing users to make nondestructive edits. 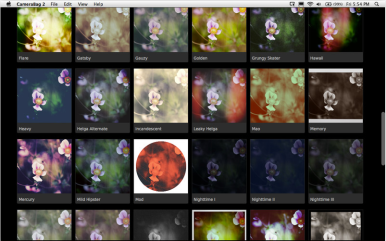 You’ll also be able to layer different filters and adjustments on top of one another. Other updates include a brand-new interface, speedier image processing, raw format and metadata support, batch saving, and 32-bits-per-channel color depth. The app is currently on sale for $20 in the Mac App Store (normally $24), and requires a Mac with a 64-bit processor and running OS X 10.6.6 or later. You can also purchase a cross-platform license (PC and Mac) for CameraBag 2 on Nevercenter’s site for $29; a 15-day free trial is also available on the company site.